Some of them seem to be more durable than others; I guess I wasn't as consistent as I thought with my backcombing. Next time! Grr... Anyway, I hope they don't fall apart *too* soon. Well, here's a shot of the back with my crappy webcam. Feel free to comment and critique any way you like. I don't get offended All tips appreciated! They look beautiful! I would say it is a nicely done set, and your install looks neat and clean. wow! this is very well done so pretty. I love these!! They look great! You're so classically pretty. They really suit you and you've done a great job with the install. Very pretty & natural, and lovely install! CirqueMachine wrote: You're so classically pretty. They really suit you and you've done a great job with the install. 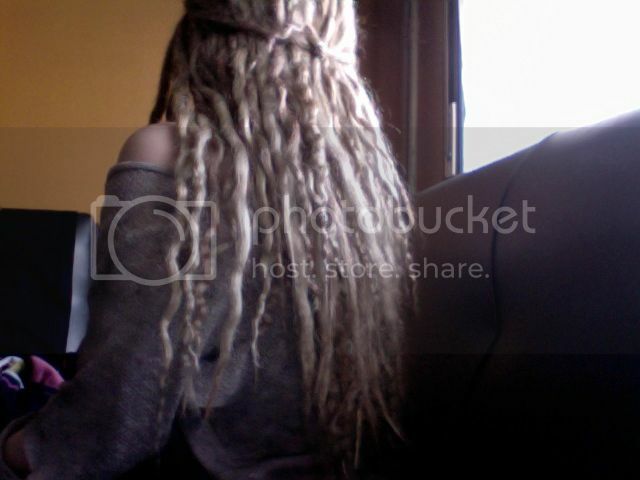 Your install looks really neat and well done, and the dreads are nice as well!